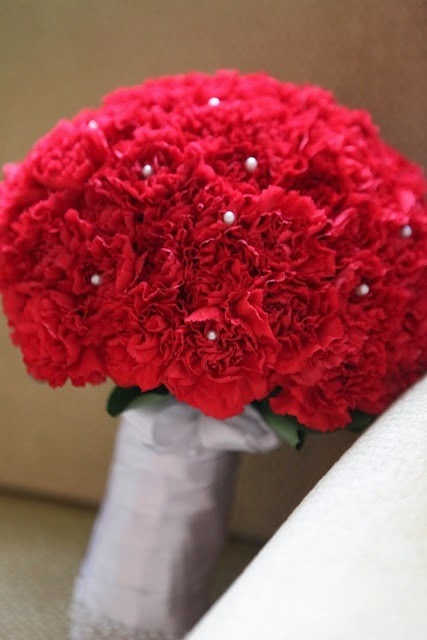 Memorable Wedding: Carnation Wedding Bouquets: Give This Sweetheart a Chance! Carnation Wedding Bouquets: Give This Sweetheart a Chance! Can you believe that many people are prejudiced against the sweet and humble carnation? During my many years as a florist, I can`t even recall how many times customers would say: "I would like a mixed long lasting bouquet but please no carnations." I could never understand why people had this misconception against this long lasting, beautiful flower. Secretly, I was in the back sniffing the hardy carnation blooms and delighting in their sweet enveloping scent. The white ones were my favorite. As a wedding flower, the carnation can be the ideal flower for many brides seeking beauty, style and cheapness. Let`s face it, there is probably no other flower as inexpensive as the carnation. And when isolated and grouped en masse in a monochromatic (one color) arrangement, the carnation transforms and shines as the elegant beauty that it truly is at its core. 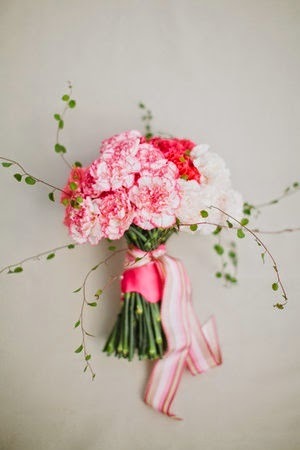 The most beautiful and stylish carnation bouquets are the most simple. Carnations come in many colors such as white, red, yellow, burgundy, purple and all shades of pink and orange. There are also many bicolor shades of carnations such as purple and white and orange and yellow. Essentially there are two types of carnations: the standard carnations and the mini carnations. The standard carnations are the larger ones that are ideal to use for wedding bouquets for the bride and the bridesmaids. They can also be used for centerpieces and flower girls` baskets. 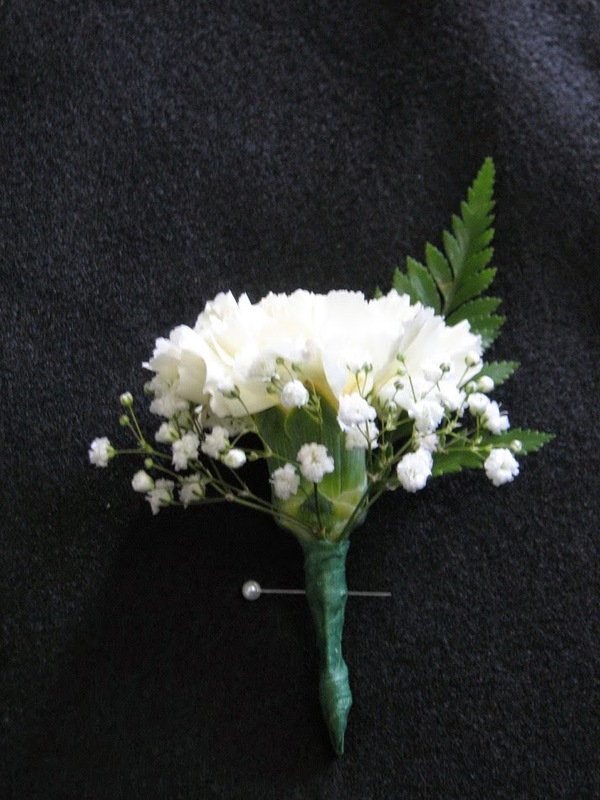 The mini carnations are perfect to use for boutonnieres and corsages. Standard carnations can be used for boutonnieres too, however, the minis are more suited to this purpose due to their size and hardiness. 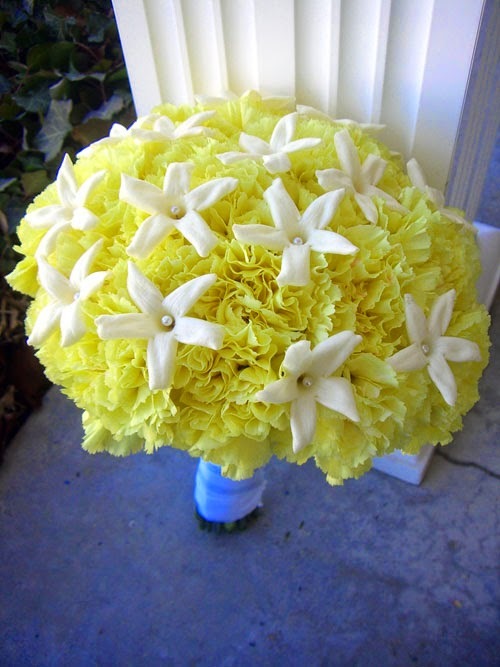 Carnation wedding bouquets are simple to make if you decide to do it yourself. Simply group a certain amount of carnations, for example 25 for the bride and 12 for the bridesmaids. Make sure all the heads are even and wrap with floral tape, 2 or 3 at a time until you have a solid mass of flowers. Decorate with greenery and ribbon to complete your bouquets. Carnation boutonnieres and corsages have lots of advantages. They are very tough and will not break easily. They can tolerate more hugs than roses or daisies without breaking or shattering. They are easy to work with and do not need any wiring, so they are easier than roses to work with. Finally, they last a long time compared to any other type of flower out of water and they are much less expensive than any other type of flower.